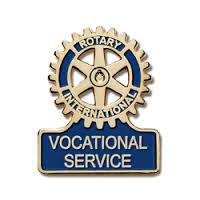 Each Rotary Club has a Vocational Services member that is charged with encouraging Rotarians to believe they have a link between the idealism of Rotary and the operation of their profession or trade. A development of this personal goal is to demonstrate this link to the wider community. Our Vocational Services members provide our Club with interesting and informative opportunities to learn about other Rotarians’ professions and occupations and to recognise members of our community that live the ideals of Rotary.